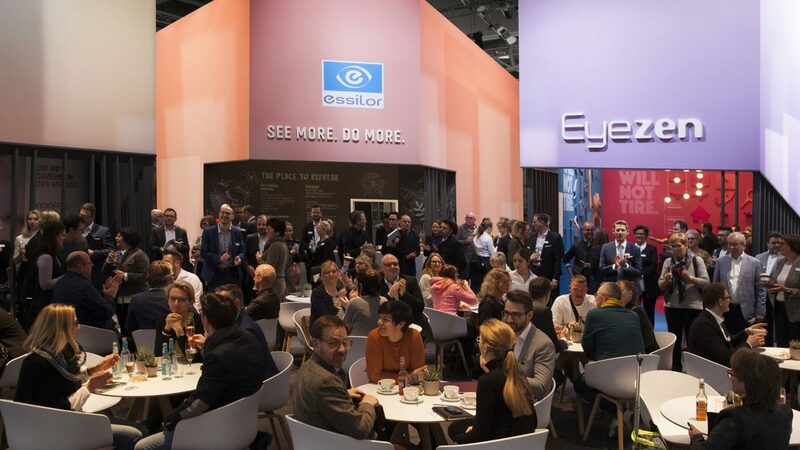 OPTI in Munich is the leading international trade fair for the eye optic industry. 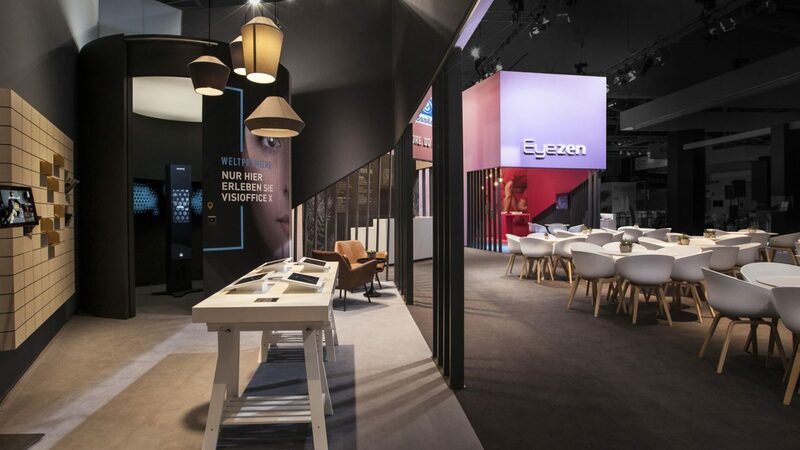 The design of Essilor's new trade fair stand allows opticians to experience how Essilor strengthens their retail communication and enables them to create an actual and attractive shopping experience for their customers by using Essilor products. 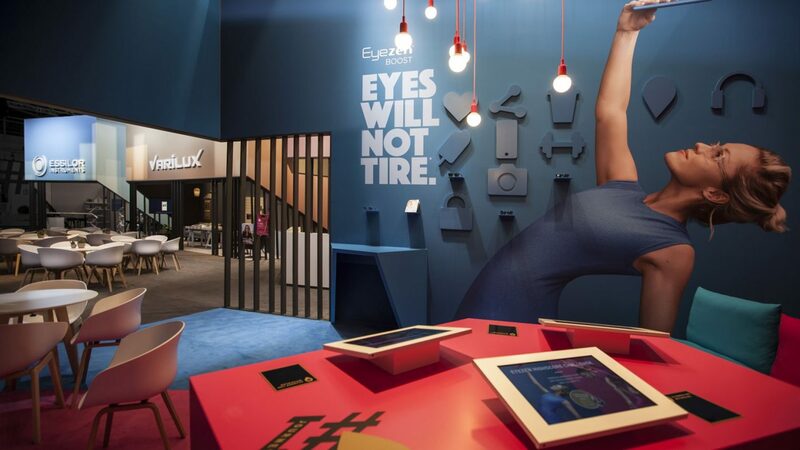 Opticians in urban city areas are a main target group for Essilor, the world's leading manufacturer of eyeglasses and producer of eye-optical instruments. They are supported by a comprehensive partner program from Essilor: Shop equipment, training and marketing campaigns are all part of this partner program. 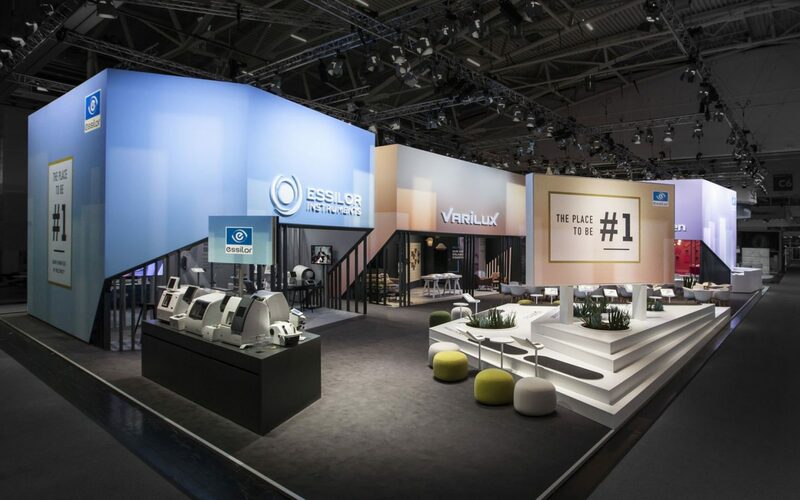 The stand clearly communicates the message: Essilor is the number one in ophthalmic optics* - with Essilor as partner, opticians themselves will become the number one. 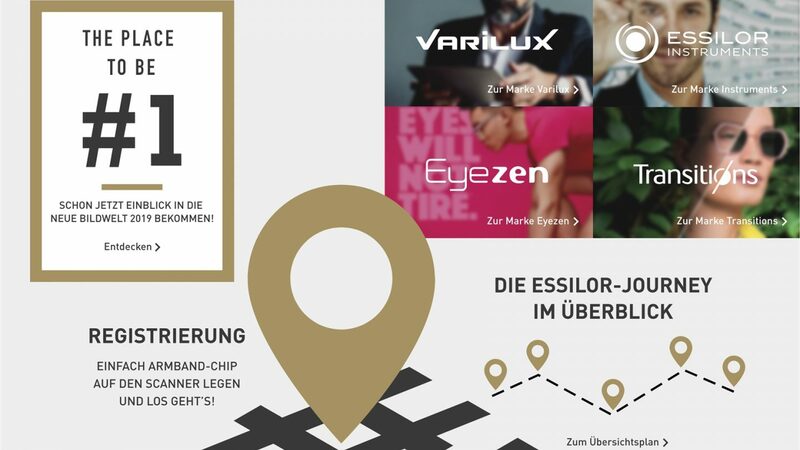 The focus lies on Essilor's product brands - in their communication, Varilux relies on timeless, elegant design, Eyezen und Transitions on the hip, urban lifestyle of young end customers. 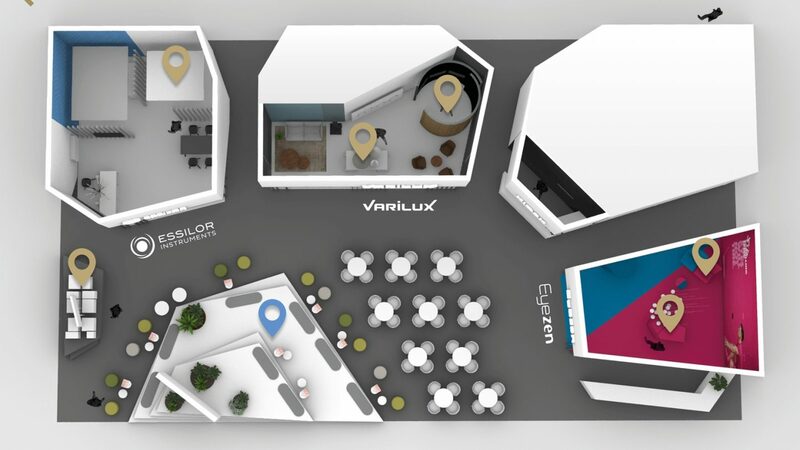 The idea of the trade fair stand: it´s an urban "place to be", where the inner city opticians are at home and life is shiny and vibrant. This welcoming and communicative place was created with three elements: A strong architectural gesture, attractive shops and a plaza as "hang-out" with a high quality of sojourn. The three richly staged shops, arranged around the plaza, were served by an open retail front concept: large exposed shop windows drew visitors inside. Attached to the buildings was a spacious communication area in the look of a sidewalk café. The plaza formed the center of the stand, where life pulsated, people met, lingered on the steps and could relax and enjoy the flair of the stand. The street café was supplied by a kiosk with an open bar counter and large chalk graphics. The huge central billboard displayed the current campaigns of the product brands. 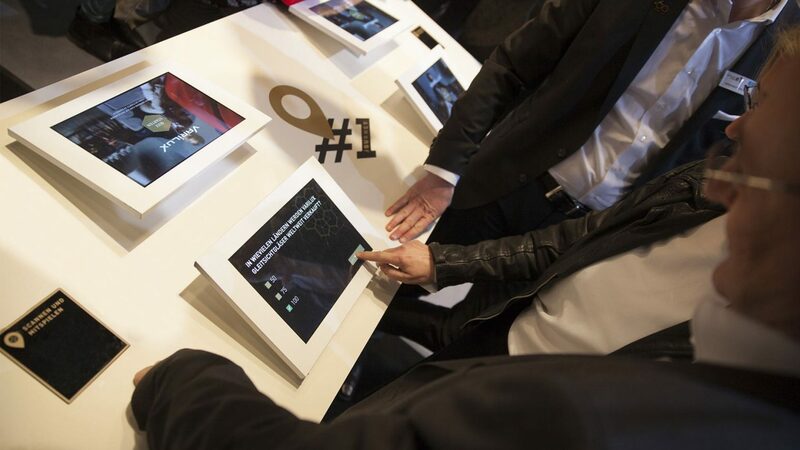 "See more, do more": the campaign was optimally integrated into this environment. 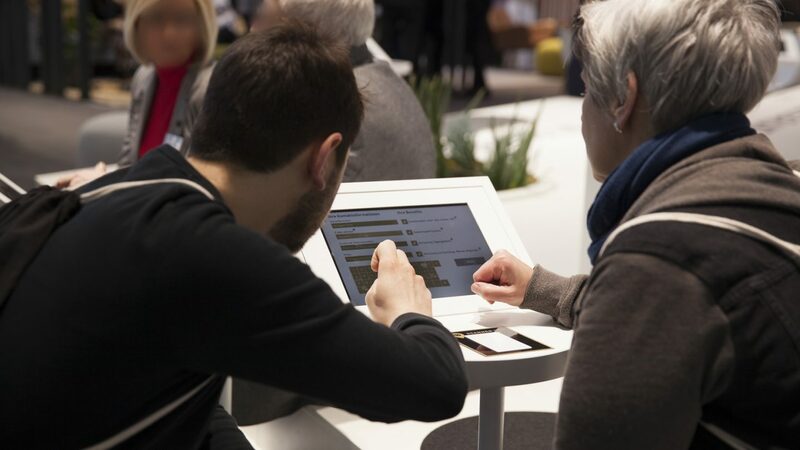 The Essilor Experience, a digital customer journey spread across the stand, supercharged the visitor´s fair experience. 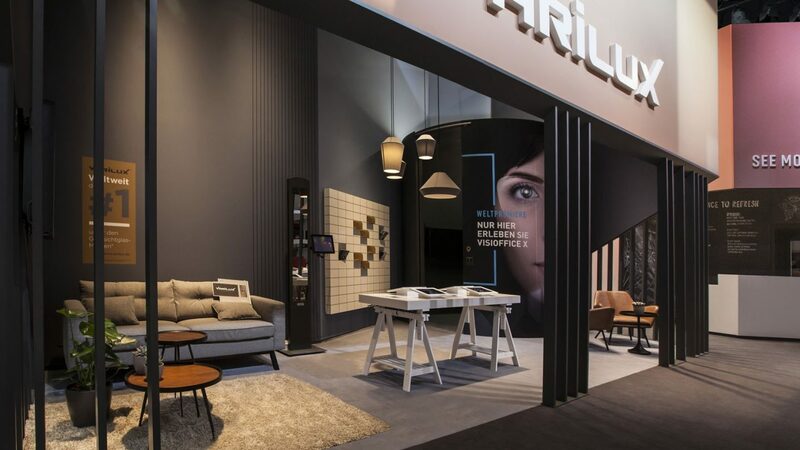 It was a live experience with services and options familiar to customers from online shopping: Quizzes and games led visitors playfully through the stand, they could save their credits by RFID, or take pictures in photo points with their social media channels. 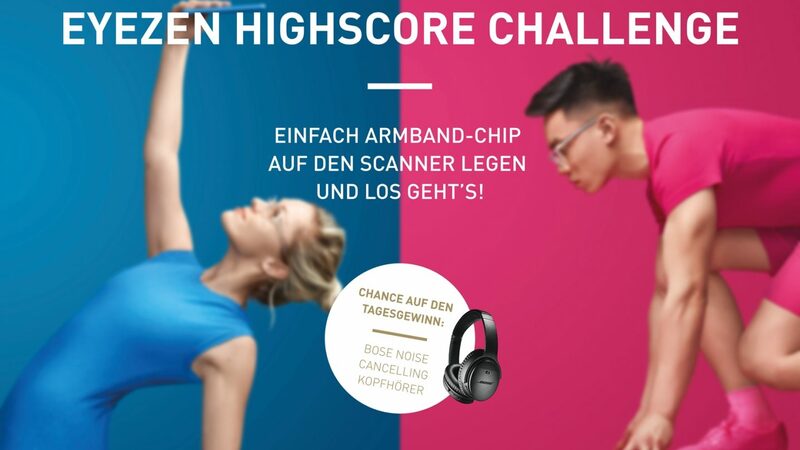 On the networking island in the plaza, visitors could then check in with their chip cards, retrieve their credits and rewards, become part of the Essilor Partner Network and take part in sweepstakes. 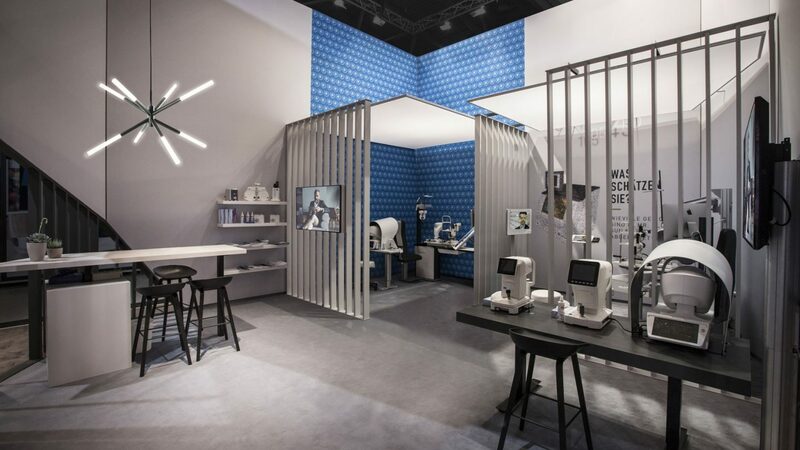 The presentation of the exhibition highlight Visioffice X was the real "eye-opener" for the opticians: Upon entering the rotunda, visitors were captivated in a small, intimate atmosphere with a medial 180-degree staging. 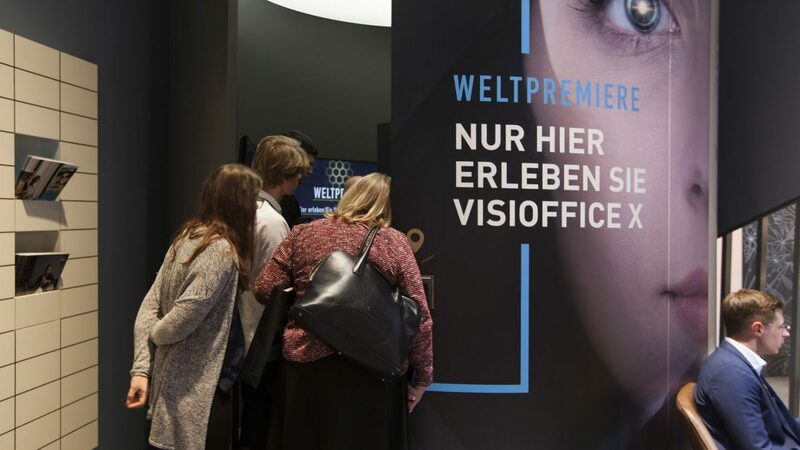 They experienced the world premiere of Visioffice X, an interactive device for measuring and analyzing all physiological and individual behavioural parameters of the eye for the individualized configuration of eyeglasses. 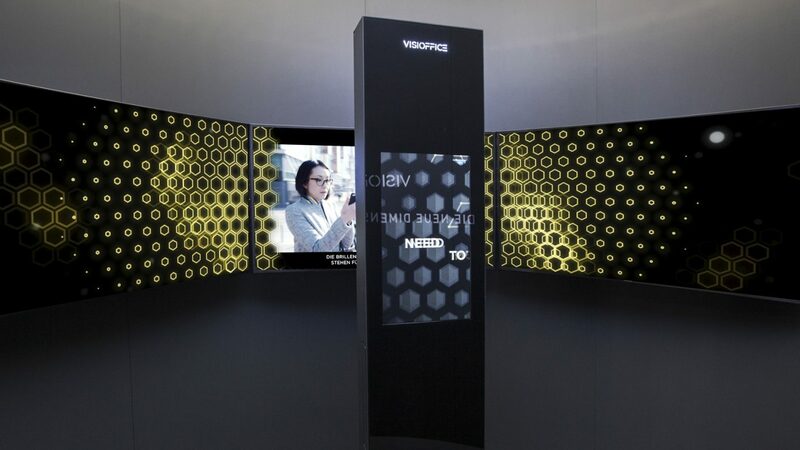 Both the experiential character of Visioffice and its functionality and benefits for the opticians were elucidated with this production. 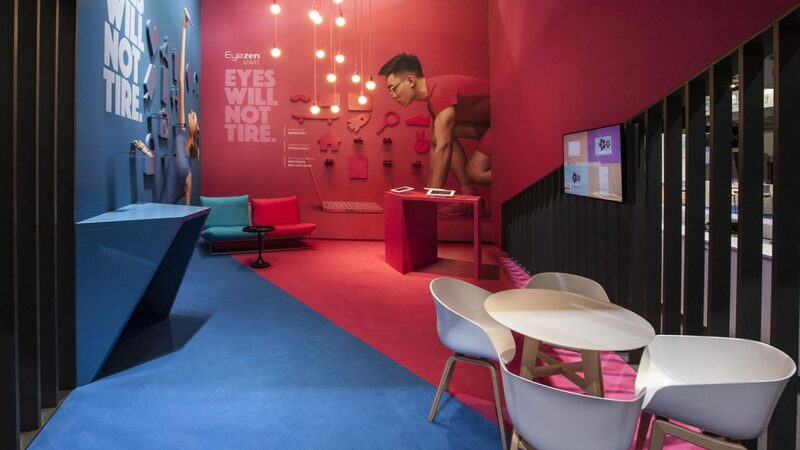 The overall concept placed the optician at the centre, at the Place to be #1. The exhibition stand will be re-used at the Opti for the following two years. 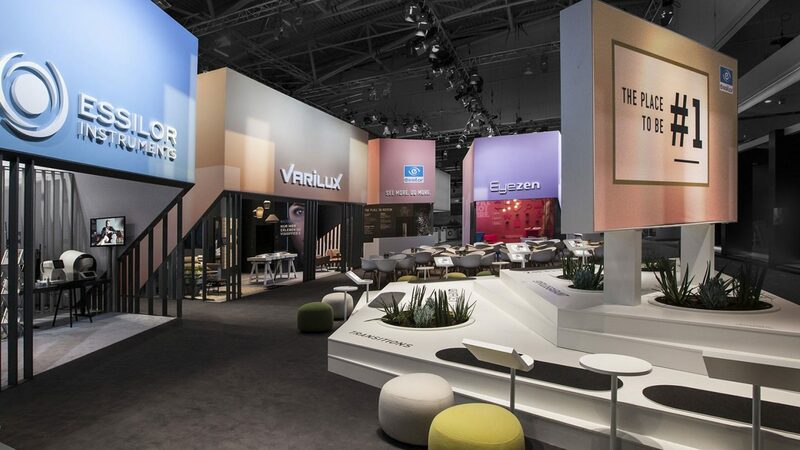 Concept, architecture and the digital journey were designed by Milla & Partner, stand graphics and the accompanying communication by RTS Rieger team.